There are those who are born in New Orleans, those who move to New Orleans, and those who dream of New Orleans. A microcosm of America’s melting pot, New Orleans is a city whose people are as diverse as its history. My parents lived there in the years before I was born. My dad worked for British Leland and my mom taught school in the Lower Ninth ward. They shared an apartment on Chartres Street across from the Le Richelieu Hotel. My mom was a fixture at the Greek bar down the street and my father faithfully marched in the Parade of Underwear each year. But then my mother got pregnant after they were both told they couldn’t have children and they decided to move back to Mobile where they would have family support. I never quite forgave them for that; I would have made an excellent French Quarter baby. When Mobile felt too small, New Orleans became our mecca. My mom and I would drive to New Orleans for the day, sometimes with just $20, where we would find street parking, then split a Po-Boy at Maspero’s in the Quarter. We would stop off at the Idea Factory where we tested all of the wooden toys. I loved reading the historic markers and eating beignets at Café DuMont. We would ride the streetcar out to the Camellia Grill, then walk over to Yvonne La Fleur to try on hats. An entire day could be spent wandering through the bookstores and vintage clothing shops. You don’t need a lot of money in New Orleans; the people and the landscape are enough to keep you entertained. My dad and I would make trips to New Orleans as well, often driving his 1961 Rolls Royce. 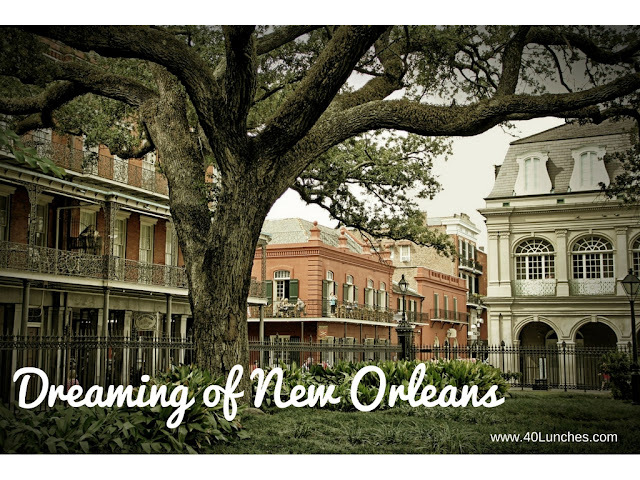 We would meander through the French Quarter where we would stop to watch the street musicians. I loved to imagine the stories the buildings could tell. Before we left he would wrap his arms around the lampposts and pull his body into horizontal position, while I begged him to stop, mortified. It was the perfect place to retreat to when we needed to escape or buy a little happiness. When my mom knew she was dying she asked me to take her to New Orleans one last time. Katrina had devastated the city just months before, and she needed to see for herself that her beloved city was still there. I drove her through the Ninth Ward where red x’s marked the houses. We wandered through the French Quarter making our requisite stop at the Idea Factory. It was bittersweet; we both knew this would be the last time we would walk the familiar streets together. It is in New Orleans, in some ways, that I feel closest to my parents. It is where they both seemed happiest and where some of our best memories were made. It is where I learned my first lessons about diversity, acceptance, and how to keep a beat. It is where my ex-husband proposed, where I fell in love with Tennessee Williams, and where I gave my first performance tap dancing on a street corner. I’ve carried on the tradition. Each year after Christmas my daughter and I drive to New Orleans and I watch as she scours the French Quarter shops with money in hand. We eat beignets and ride the street car, and I tell her stories about her grandparents and the memories we made together. Follow 40 Lunches on Facebook and Twitter.